Today and tomorrow are among the busiest days of the year in Boston as students and young professionals move in and out of their Sept. 1 apartments. I know at least 20 people who are moving or who have recently moved, including my friend Paul, who moved into a building featuring a bizarre abbreviation/apostrophe catastrophe. 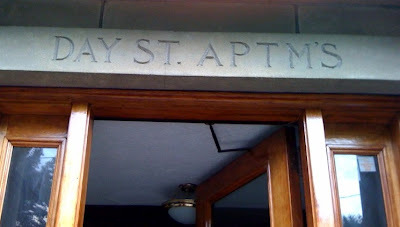 Apostrophes can indicate missing letters, so ap'tm's might be OK, but Aptm's strikes me as very odd. I don't know if I could live there! Thanks to Rich for taking the photo. Good luck with moving! I was hanging out with my friend Amy last night, and I brought up Apostrophe Catastrophes as we were looking at the menu, and sure enough, the menu contained a glaring grammatical error. Firefly's web site makes the same mistake, among others. Incidentally, have you ever walked around Boston on a Sunday morning between 9 and 11 a.m.? There are very few early birds around; most people are still sleeping it off. 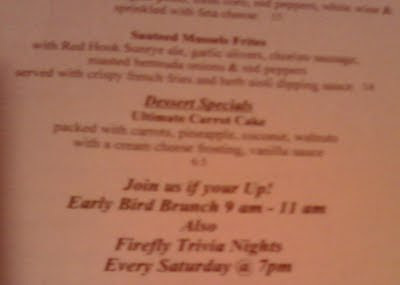 Grammatical errors aside, Firefly had excellent food. We had some delicious strawberry and spinach salad and spicy portobello mushroom pizza. This shop in Indianapolis would like to remind us that Robert Plant is still with us. Molly, who sent in this catastrophe, said she has always wanted to go in and ask who Plant is. I think she should do it and report back to us, right? 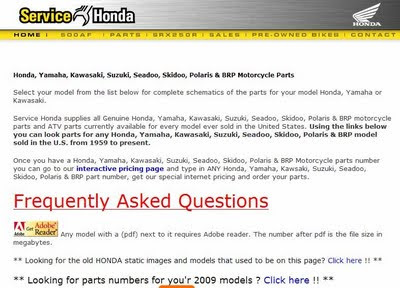 I'll bet the Service Honda folks didn't know the difference between your and you're so they decided to split the difference. Thanks to Kim for sending in this catastrophe -- and to her brother for finding it while shopping for parts. 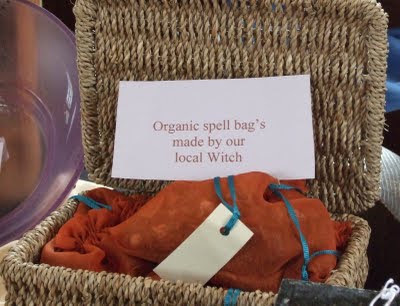 I don't want to criticize it too much because I'm afraid the Witch might put a spell on me. And why is Witch capitalized? 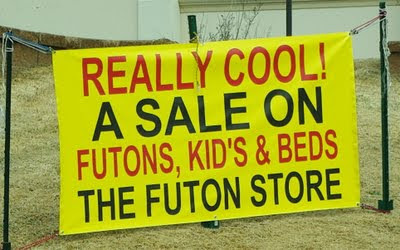 This store in Cordova, Tenn., appears to be selling futons, kid's [sic], and beds. I wonder if anyone ever goes into the store and asks to buy a kid. Thanks to Lisa for sending this one in! 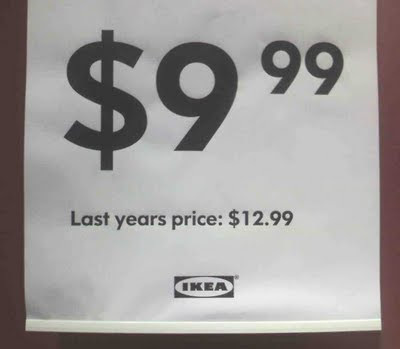 At the Charlotte IKEA, Michelle noticed more than just the low prices. Perhaps they're saving money on ink. 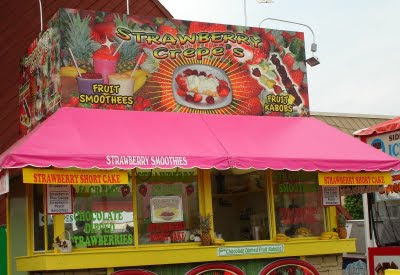 Unlike most of the food being sold at the Wisconsin State Fair, the strawberry crepe's [sic] didn't come on a stick. As tempting as cheesecake on a stick sounded, I went with bacon-wrapped water chesnuts. Seriously. And now I am seriously on a diet. If you're tweeting about religion, it's probably wise to spell the names of Biblical figures correctly. Shame on you, @JewishTweets. To you I say the opposite of mazel tov. Besides the apostrophe catastrophe, this tweet also contains a comma calamity because Moses had only one brother. So, it should read, Moses' brother, Aaron. Thanks to Adina for sending this one in. As the Black Eyed Peas might say, l'chaim! My friend Rich e-mailed me this photo with the subject "This is not a sentence." He's right. 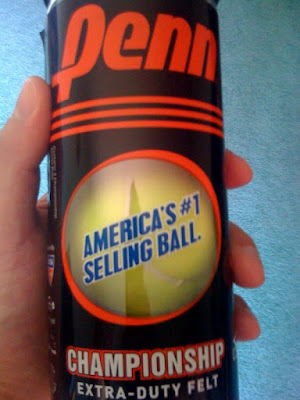 Also, what's a "selling ball"? Mmm... nothing like a delicious meal of steak, cocktails, and baby, with two sides of apostrophe catastrophe. Thanks to Brian, a frequent contributor to Apostrophe Catastrophes, for sending in this photo that his sister took in Cesky Krumlov, in the Czech Republic. 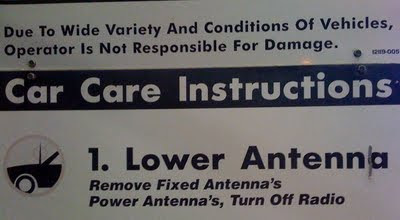 This carwash in LA seems very concerned about antenna's [sic]. Thanks to Ben for sending in this double apostrophe catastrophe! So, apparently, Twitter wasn't working this morning, which caused all kind of chaos on the Internet, including apostrophe failure over at techcrunch.com. 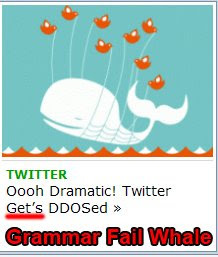 Credit goes to Tom for sending the above screenshots and coining the phrase "grammar fail whale." In case you don't get the joke, it's clever Twitter humor. I still don't entirely understand what DDOS means, though. Speaking of Twitter, you can follow Apostrophe Catastrophes at twitter.com/apostrophecatas. The Metropolitan Transit Authority is so complex. They are able to use semicolons correctly, but they don't know the difference between its and it's. See the last sentences of each of the blurbs below. Thanks to my friend John (a.k.a. my friend Stephanie's fiance) for sending this one in!